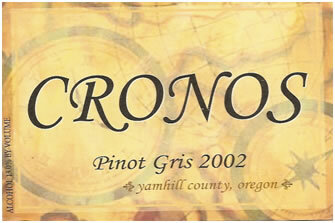 Not much is known about Cronos Wines - when the winery was established and the date of their final vintage. The winery reportedly used progressive viticulture and crafted their wines with state of the art winemaking techniques. The address listed for the winery was P.O. Box 1223. McMinnville, OR. Tastings were by appointment and held at a location on Youngbird Hill Road, McMinnville.